That's perfectly normal, pretty much every old system does that. Now I just got to get CSYNC connected for a hopefully better picture, did notice faint lines in my picture, but not enough to hinder the game play. This is my first post here so be nice. I read every page of this thread. Very informative. I have this board installed on my frontloader and everything is great. But I want to try something new with the audio and so far the related post here have not worked. Normally I use the stock Mono and enable the expansion audio with a resistor between pin 40 to expansion pin 3. Works fine with my everdrive or powerpak. "2.) On the regular front loader sound circuit you would connect expansion pin 40 to expansion pin 3 which would mix the Famicom expansion audio into the NES sound circuit. Do not do this because if pin 3 is connected then the Famicom expansion audio won't be present on the NESRGB sound output. Instead we will be connecting a 20K ohm resistor to pin 40 on the NES expansion port and running a wire from that to the NESRGB board. Here's a picture of expansion pin 40 http://i.imgur.com/nNixYV3.jpg. You will run the wire around to the NESRGB board and connect it to one of the red points in this picture http://i.imgur.com/XCEwnaL.jpg?1. Don't worry if you bridge the 2 red connections. They are already connected on the PCB." I posted this original comment long ago hoping for at-least 1 reply. Can someone help me with this issue? and Yes I did read all 128 pages of this thread. I could not find an answer. I simply want expansion audio mixed with the NESRGB audio output. I can not locate the expansion source. Trying to figure this out on frontloader and toploader. all of the newer Nesrgb boards have a hole in them right under those resistors on the nesrgb to conenect expansion audio to. The first picture is your expansion audio source. Pin 40 on the expansion connector. The second one is where you would connect it to on the nesrgb. He is right. The latest boards have a small revision and they may have confused newcomers. Speaking of expansion audio, I'm looking to completely bypass the stock circuit of an AV Famicom due to it's mixing issue. There's an old post in this thread that had alot of details this however it's imgur images have since been deleted. The majority of this process is pretty easy to find via google; isolate pins 45 and 46 of the cartridge connector from the existing audio circuit and connect 46 to the through-hole solder point (added in later NESRGB boards) via a 100kOhm resistor, with the resistor at the NESRGB end. EDIT - Q/A1: Further reading suggests the 100k value is for real cartridges. 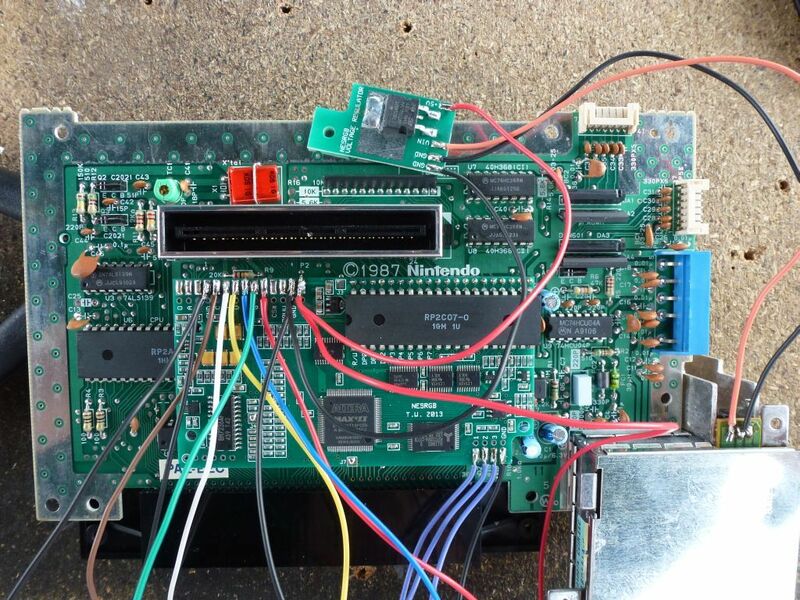 Q2: Is there a known reasonably-correct value for the everdrive? Q3: My instinct is that cartridges without expansion audio will cause the expansion audio line to pick up noise with pin 45 floating, if so, what would be the proper termination method that wouldn't interfere with cartridges that do have expansion audio? Q3 keep the resistor lead going to the solder pad on the NESRGB as short as possible. ?? What mixing issue? Famicom AV is able to play EXP audio as is. I don't bother using the NESRGB audio circuit with this system. No point as far as I can tell. 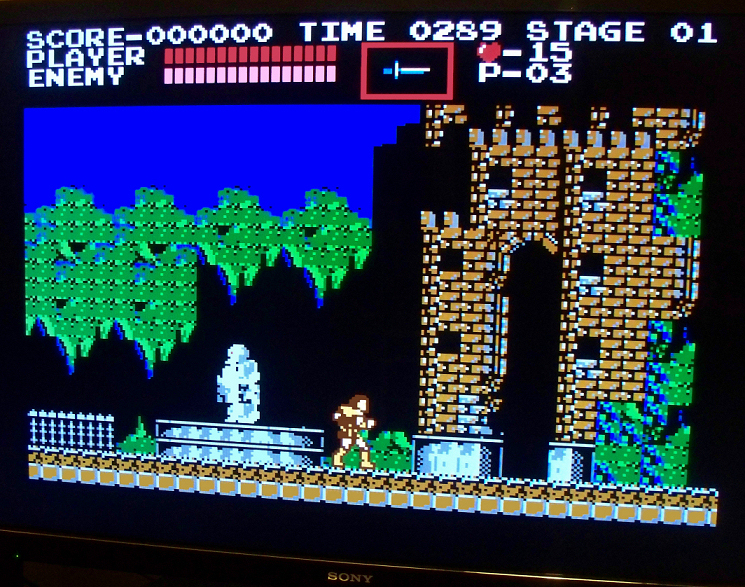 IIRC certain revisions of the AV Famicom have volume mixing issues with the Disk System. It's possible I'm thinking of the Twin Famicom though. The Twin definitely plays FDS audio loudly. Yep, I opted to use the NESRGB's audio circuit instead. Evened out everything just fine and bypassed the muffling from that capacitor on the original audio circuit. On the AV Fami the expansion audio is supposedly too loud, but on mine using an expansion audio game causes the system audio to be pulled low, varying by which game, compared to a normal game. I'm aware of the 100k feedback resistor on the 40H368 being used as an amp for original models having been changed to 43k on GPM models (which also have too loud expansion audio) and 68k on the AV Fami. But unless I'm just missing something, lower gain shouldn't result in the variable drop in audio level I'm experiencing, so I assumed something must be significantly different about the Nintendo chip that replaced the 40H368s on the AV Fami and decided to bypass the stock audio circuit. EDIT - To preempt the power supply question, a Genesis Model 1 PSU. If I had a parts bin or a junk device to pull parts from, I would replace the 68k feedback with a 100k, however I currently do not. Ok I now have the expansion audio BUT that photo used is not correct. I found that pin 9 directly above the one in the photo in the audio source. No wonder I had so much difficulty? Why am I the only one to notice this. Am I mistaken? 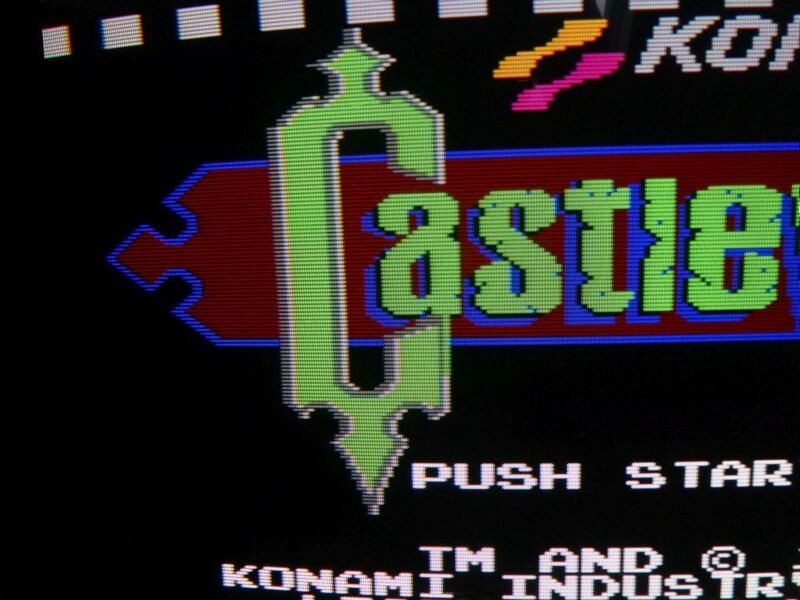 I notice that the expansion sound even with 20k resistor introduces background buzzing on some games. Try this circuit for expansion audio. Resistor R3 must be mounted on the NESRGB board with one leg in the mixing hole (right near the label J5). For the NES you must put the switch in the mute position when normal (no extra audio) games are on otherwise you will get noise. For the Famicom AV you need to isolate the cartridge pins 45 and 46 before connecting wires. If you only play cartridges or Everdrive you can leave out the switch. I don't know if the audio level is correct for the RetroUSB Powerpak. Hopefully this gets added somewhere on the nesrgb page so everyone in the future looking can find it. I actually thought it was pin 9 too but i couldnt remember. its the 9th one over. heh. Ive bulilt several toaster nesrgbs now and its basically become routine. I remember someone was asking the best way to get rgb out of your nes. 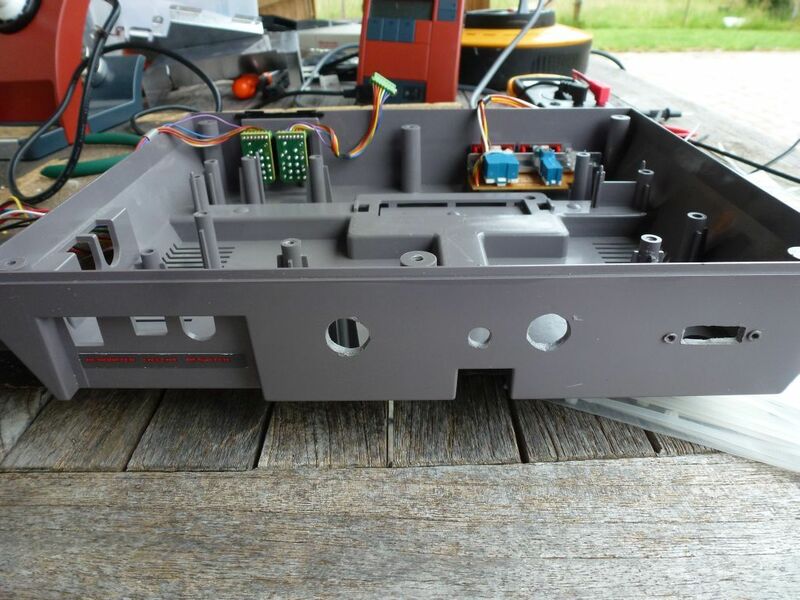 This is the first Rgb Nes I built. Its an old RP2C03 mod. The Nesrgb is better than this in every way. The old ppu mod had interference, wrong colors and some games like Felix the cat wouldnt even work with it. Not only that, but it looked bad compared to the nesrgb. Its great that we have the Nesrgb now. Its the BEST way to get rgb out of your nes. Hey guys, a friend of mine had his NESRGB modded system stop working. 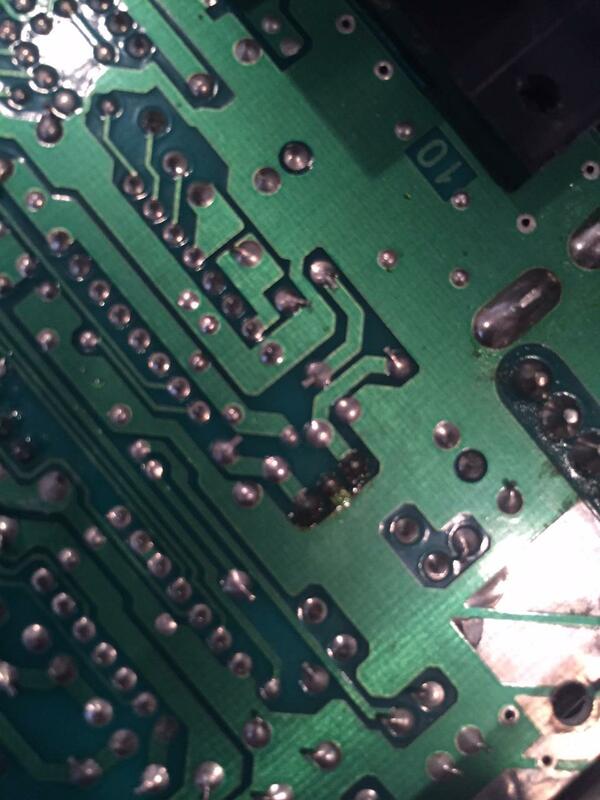 He found what looks to be a burnt component on his PCB and sent me a couple pics of it. I'm not sure what the component is (rectangular white box). Any ideas if a repair is possible and if it's due to a faulty install of the NESRGB? It's not burnt, that's just solder flux. I highly doubt that's what failed in his installation. Hmm, it looks pretty black compared to all the other points on the pcb. 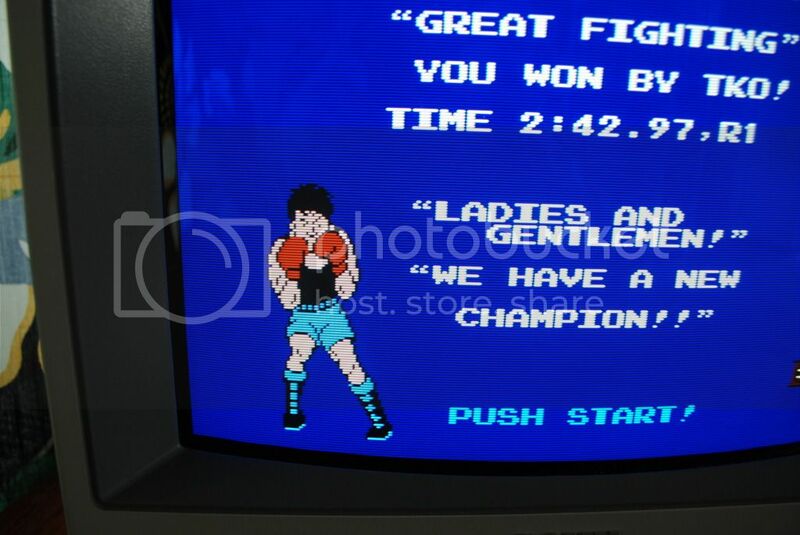 The nes powers up and the red light comes on, solid. But there's no rgb video and nothing from the stock composite output. No sound either. Finally, after having received my PAL frontloader kits 18 months ago (!!) 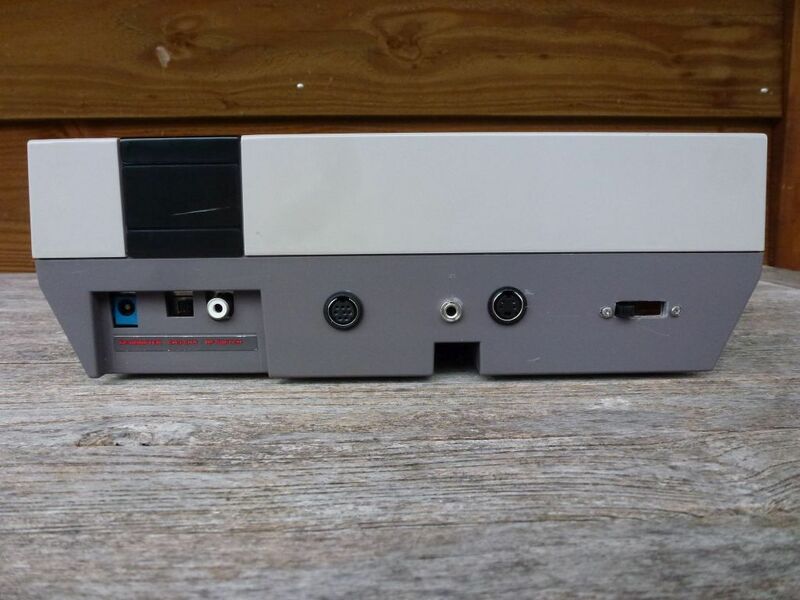 I had the opportunity to build one into my NES. 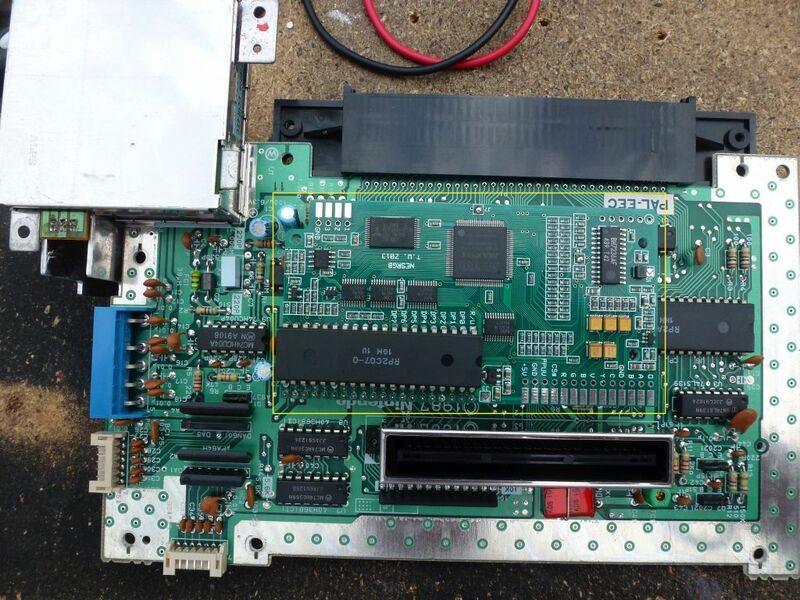 A friend of mine, who has much better soldering skills than I have, was kind enough to desolder the PPU and solder and install the board onto the NES mobo. 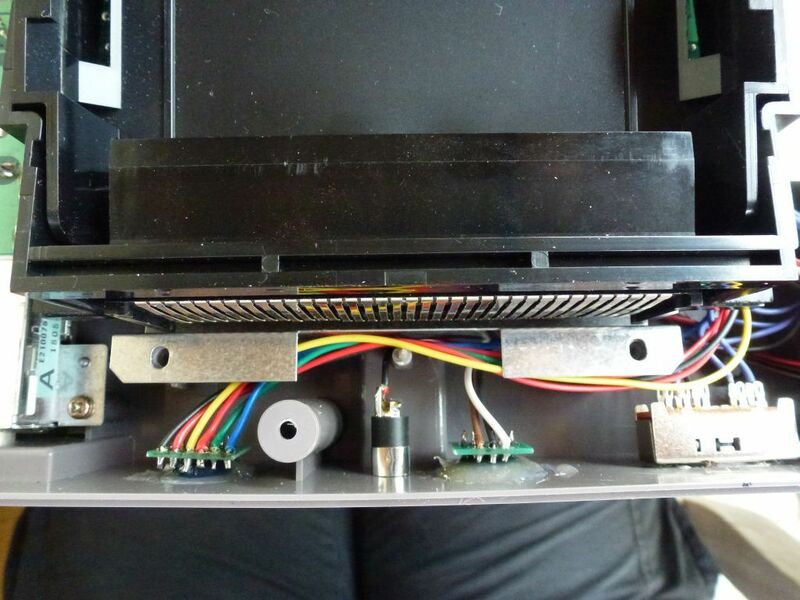 Yesterday I did the remaing work, including modding the NES case, and that went OK (although, while testing the games I realized that I forgot to wire-up the sound to the CPU, so today I had to re-open the console for that little job. Went OK also). 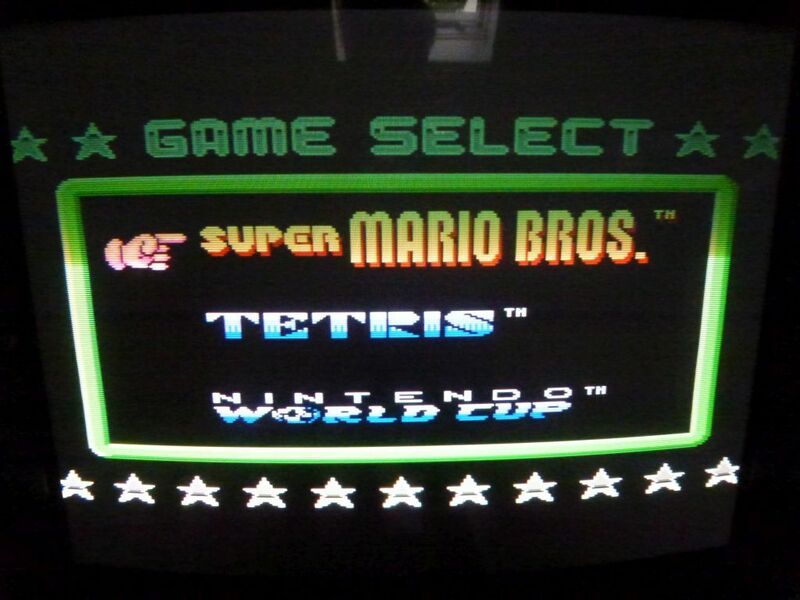 Time to test a few games (on a Sony PVM), and this made me very, very happy. The game picture is superb. My pictures may not show it that well, but that is because of the lauzy photographer. BTW, it does work flawlessly with the Everdrive cart. And it's a fun to play with the color palettes, so much variation! Thanks, Tim. Last edited by ckong on Fri Jul 10, 2015 12:56 pm, edited 3 times in total. Nice, ckong. Always happy to see another NESRGB install singing to a display. Just got my everdrive in, and my NESRGB still looks fantastic. The sound however started buzzing after it was warmed up. I finally correctly diagnosed it as a case of cheap power supply. I guess all the added electronics were just too much. An official genny 1 PS is doing the job nicely until I can get a replacement. NESRGB on my previous PVM (14M2MDE). Finally, after having received my PAL frontloader kits 18 months ago (!!) 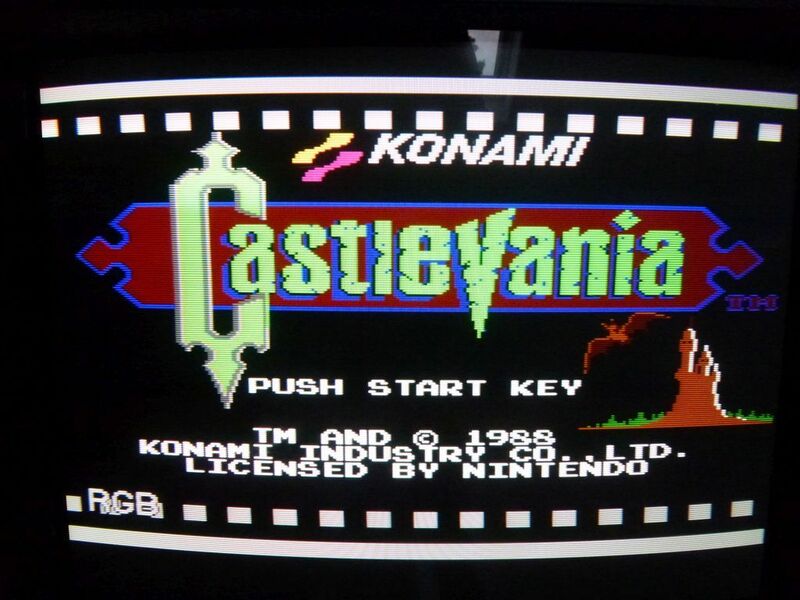 I had the opportunity to build the kit into my NES. 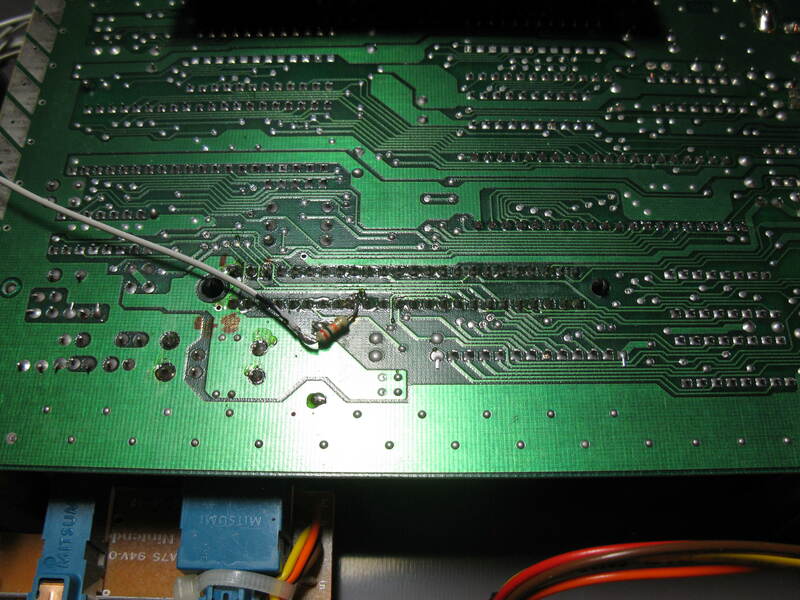 A friend of mine, who has much better soldering skills than I have, was kind enough to desolder the PPU and solder and install the board onto the NES mobo. And here you can see how he did it, in an original way. Thanks again mate. Having double and triple checked connections and that the traces to cartridge pins 45 and 46 are severed, I'm finding that the expansion audio is too quiet (or the main system audio too loud). Is there anything in particular I should check for mistakes that may be pulling the expansion audio lower (or the main audio higher)? 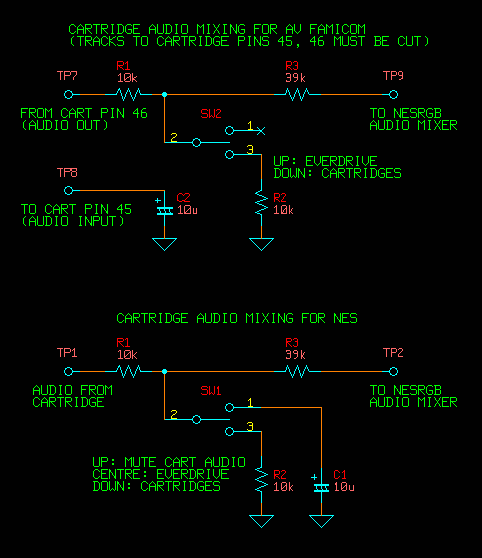 EDIT: After experimentation, it appears that the capacitor to ground is affecting expansion audio cartridges, so it seems the NES configuration posted is the correct one to use.